Spent a leisurely morning at the hotel and met Maggie at 1:00. 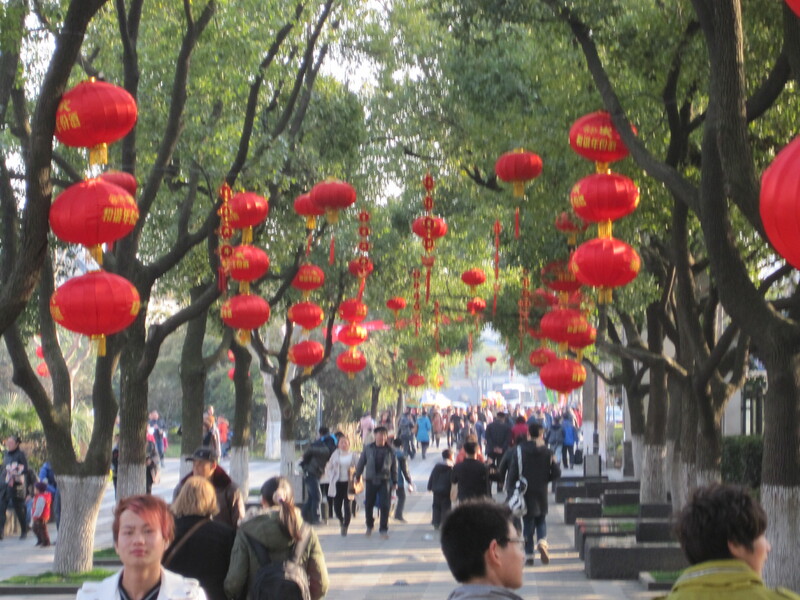 We walked around the city and then went on a tour of Tianning Temple. 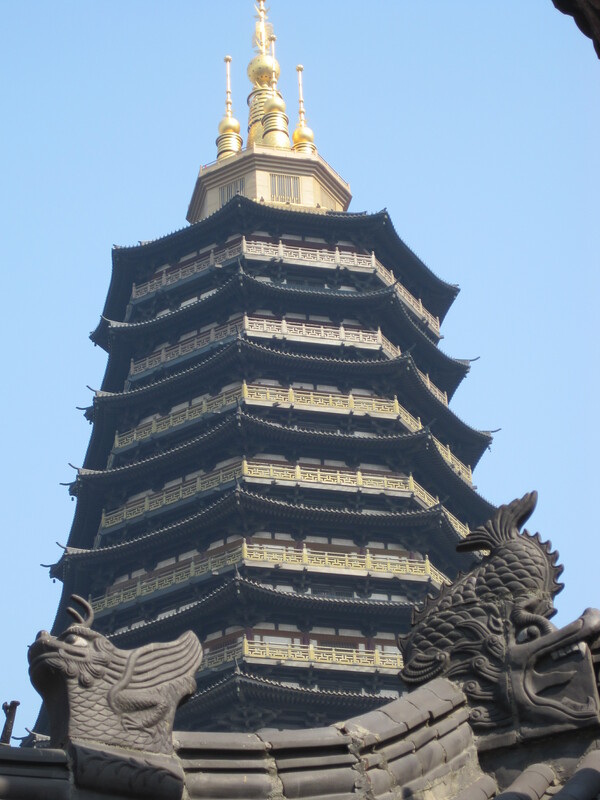 This is a Buddhist temple with a 13 story wooden pagoda said to be the tallest in the world. 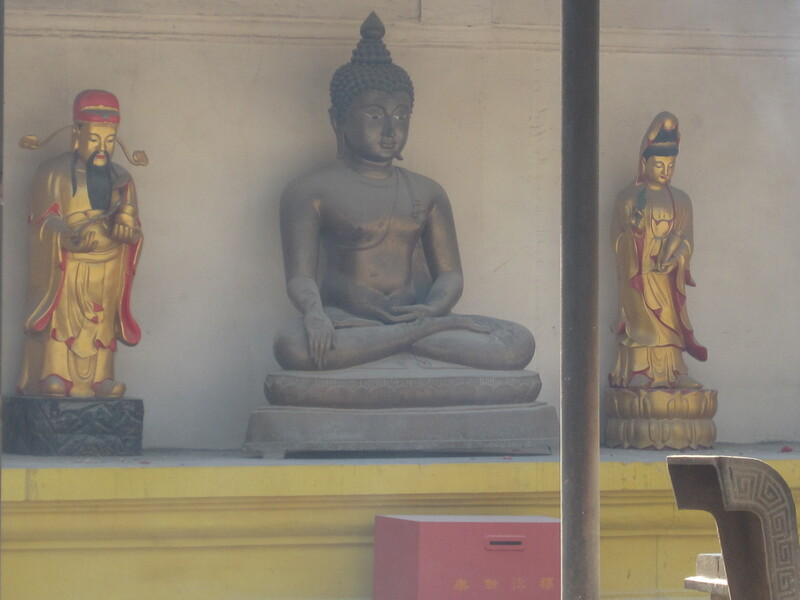 Some of the statues of Buddha contained in this museum temple go back to the Tang Dynasty. We saw and learned about the many faces and forms of Buddha represented in wood, ivory, jade, Chrystal, gold and bronze. Buddha can be represented as a smiling Buddha, and angry Buddha, a Buddha that will bring you health, or wealth, or happiness, or knowledge. Basically, Buddha is described as an “Awakened One”. Because he has awakened from the sleep of ignorance and has removed all obstructions from his mind, he knows everything of the past, present, and future, directly and simultaneously. Moreover, Buddha has great compassion which is completely impartial, embracing all living beings without discrimination. Buddhas can guide you to the four kingdoms of heavens – north, south, east, and west. As we walked up to the high temple we moved from an area of stillness through a brisk wind – and as we got nearer we could hear the tingling of the temple bells that hung from every corner and eaves of the six-sided pagoda and on every story The sound was very harmonious. Along with this the prayer flags were flapping in the wind and it all felt very spiritual. Inside the temple there were very large and intricate bronze carvings on all of the walls, depicting the story and history of Buddha and how he came to be a God. Historical and newly carved Buddhas of every size and material were everywhere to be seen, including a hall of a thousand Buddhas. 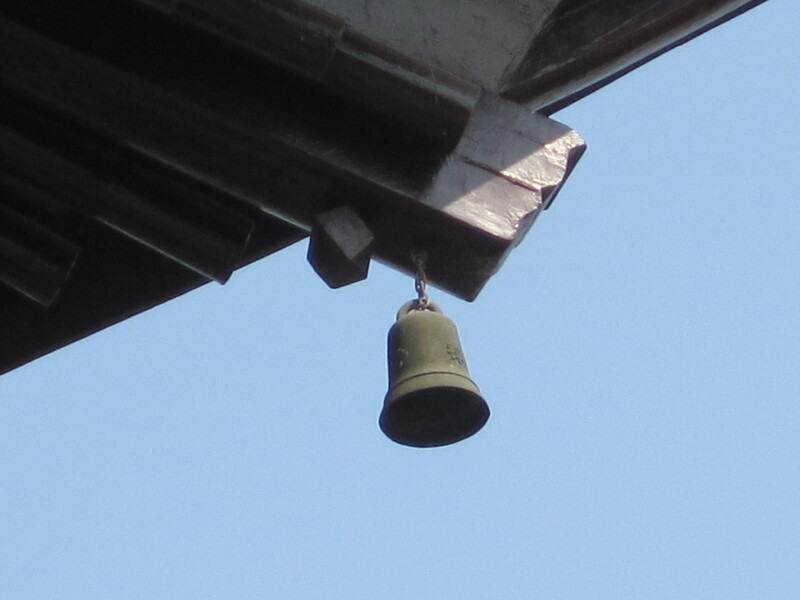 At the top level was a very large brass bell, that is rung on special occasions. 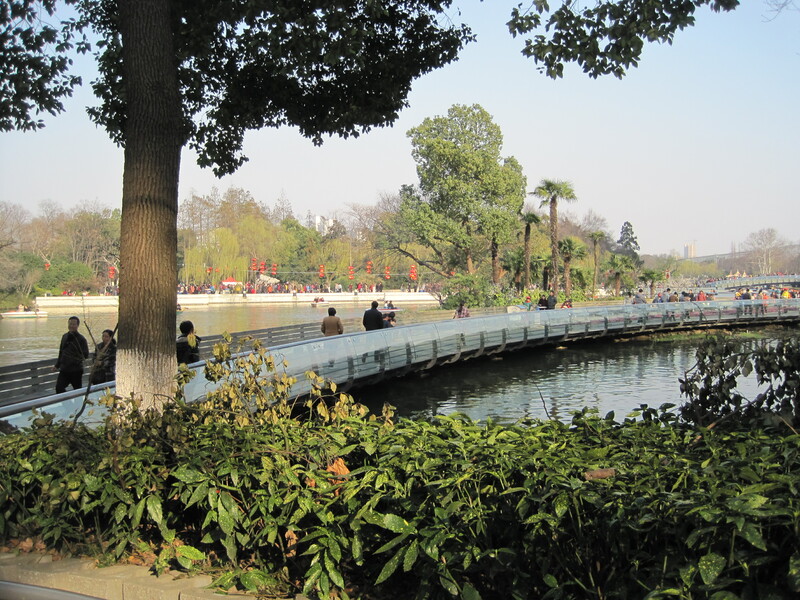 After we left the temple we walked through Hong Mei Park, a large park with an assortment of lakes, pavilions and gardens. Plum blossoms and cherry blossoms were starting to come out, and the garden was hung with a multitude of Chinese lanterns left over from the Spring Festival celebrations. We were told that there was a tea house in the park, and we found a tea house there, but not in the traditional sense that we were hoping for. We did have a cup of tea and a snack in the tea house we found, and it was a place of calm and quiet away from the bustling crowds. As we sipped our tea we noticed the clackity-clack of Mah Jong tiles being set up for games of chance in private rooms. As we continued through the park and back to dinner, we notices small boats on the lakes and canals of the park as families and couples relaxed together, old men were playing cards at small tables, surrounded by groups of men making side bets and fortune tellers spread mats out on the sidewalks in front of them, offering to tell you of your future for a small fee. Maggie, our companion/interpreter, is a young girl just out of university, and a very good companion, doing her best to look after both Ron and I, which as you know can be quite a task. She makes sure to take my arm as we go up or down stairs, and makes sure we have all the water and food we could possibly need. Maggie said she liked pizza so we took her to a Pizza Hut for dinner, which was nothing like a Pizza Hut at home, with about a 20 page menu and some fairly strange items available. We did have pizza though, and spaghetti, which filled us up completely. I take away from this day memories of a day spent in good companionship and lovely surroundings. 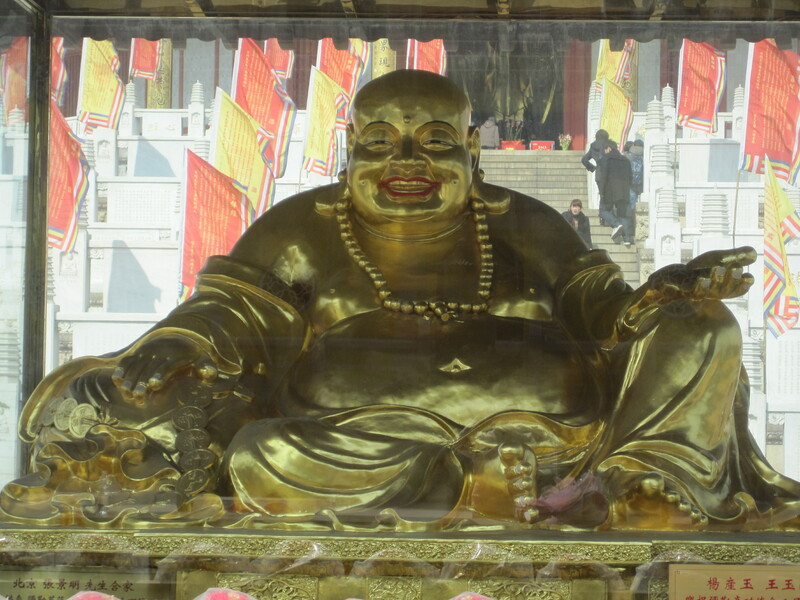 And every time I see a Smiling Buddha, it brings a big smile to my own face and a great feeling of happiness. 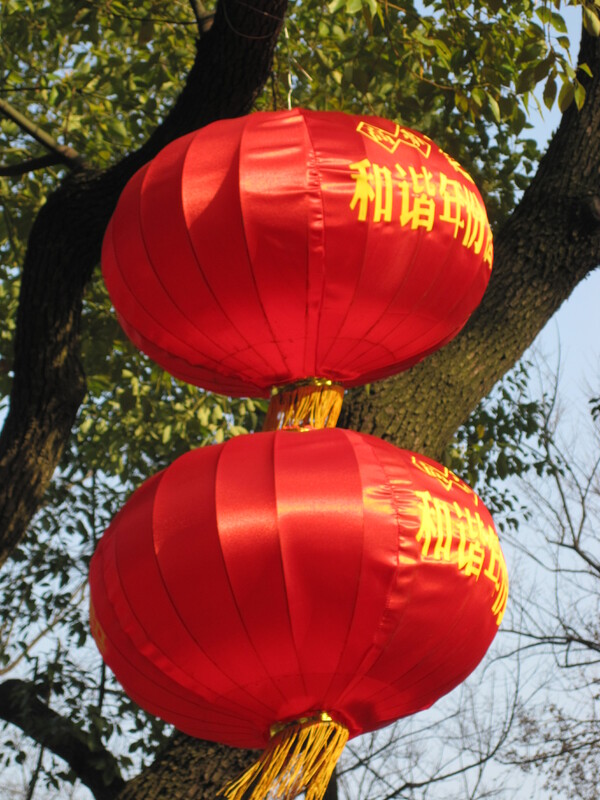 This entry was posted in Uncategorized and tagged Buddha, Changzhou, Tianning Temple. Bookmark the permalink.